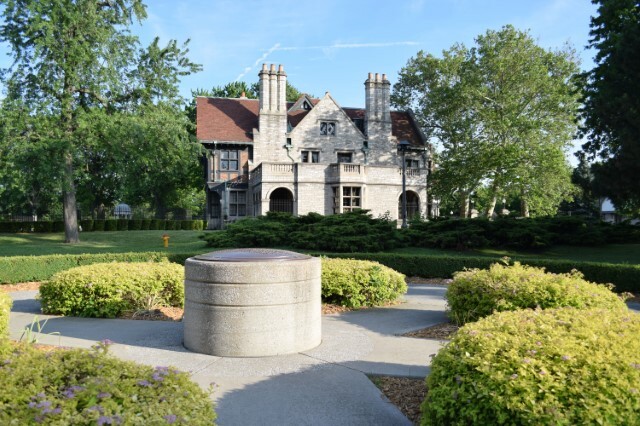 ​The Rotary Monument is a decorative garden thanking the Windsor Rotary Club 1918 for all of its contributions over the years to the restoration of Willistead. The garden features pie-shaped gardens forming a wheel, the symbol of the Rotary Club International. In the centre is a pedestal with a bronze dome engraved with a tribute message honoring the Rotary Club. Yellow and blue flowers complement the design within each section. Created by Stephen Marshall Design, the new garden was developed with the assistance of Parks and Recreation.